Walters Brother’s Harley-Davidson has a long and storied history. In 1921, they started as Walters Brothers Motorcycle and Bicycle Shop by brothers, Ambrose (Bruce) and Robert (Bob), becoming Walters Brother’s Harley-Davidson in 1922. Bruce built a new store in Peoria, IL in 1949 and Wayne Weibler began working for him as an apprentice in 1951. Wayne would go on to buy the dealership in 1979, building a new facility in 1998 and bringing his sons, Steve and Scott, and nephew Bill Wiebler into managing the business in 2012. Holding a monthly event at the dealership is a great excuse to market to your buying base with a compelling message. The first step is targeting the people who are most likely to respond and spend money at the store. We don’t care about anyone else. It’s not your job to convince a non-motorcycle/enthusiast to join the industry. That’s the job of the manufacturer. With your limited time, energy and budget, your job is to get the best possible results for your money. The way to do that, is to identify your buying base. These is a combination of past customers and conquest customers, or folks who ride what you sell, live in your backyard, but have never bought from you. Next, it’s time to hit them 52-104 times per year. That may sound like a lot, but the Sharp Shooter Program uses up to 12 different, direct marketing strategies per campaign (or month) to guarantee you are achieving your goal of 52-104 touches. The key here, is making sure you have the right message. Think about some of your hobbies outside of the business, something your passionate about. I’ll use golf as an example. If a local golf store invited you into an open house once per month for food, drinks, demos on the new clubs, and more…would you attend at least one of them? Of course. Fact is everyone loves getting invited to a party. So, if your invite you buying base to a party at your dealership 12 times per year, over time you will own them. We’ve proven that focusing your message on the party and not the sale is the fastest way to create affinity with your buying base, turn prospects into customers and achieve your best ROI. By focusing on the party/event, you’ll create many more opportunities by not alienating the 99% of folks who didn’t have ‘buy a bike’ on their ‘top 5 things to do this week list’. You’ll still get those guys, you’ll just get everyone else, plant seeds for future sales and hold higher margin since you won’t be discounting. With this style of marketing, the event doesn’t mark the end of your campaign, but the beginning of a month-long sales process working the leads that were generated. The actual results of the event are a happy bi-product of following a system to touch your buying base 52 to 104 times per year so that you can increase customer retention and carve off new market share. Every month, there are several great, relevant excuses to market to your base. The theme of your party should be relevant to the broadest base possible and should tap into the conversation already going on in the heads of your customers. This is exactly what Walters Brother’s H-D did the weekend before the 4th of July with their ‘Stars, Stripes & Bikes’ Party. The Wednesday before the event, we delivered the Campaign Update which includes a list of leads generated from the campaign up to that point. 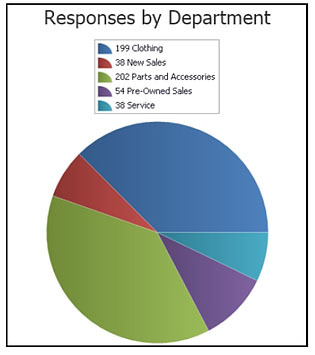 Walters Brothers marketed to 2,500 past customers and had 547 surveys completed, which created a total of 439 sales opportunities in P&A, Service, and riding gear, PLUS 92 responses for a new or used bike. This resulted in a 21.71% response rate, which is over 20x’s the national average for direct response marketing! Our most successful clients don’t look at this program like an event marketing solution. You can’t do this once or twice per year and truly grow your business…just like you can’t go to the gym once or twice and expect to be fit. You’ve got to go consistently. But if you market to your buying base consistently, over time, you’ll own them. If you don’t currently have a plan in place to hit your buying base 52-104 times per year, call us today and we will help you identify that group of customers is where the majority, it not all of your future sales should come from this year. The results you want out of your marketing start here. We’ve got lots of great excuses to market to you base this month. Check out the inserts for just a few examples. To have Powersports Marketing build your dealership’s Buying Base and put a plan in place to hit them consistently for FREE, call me on my direct line at 877-242-4472 ext: 112 or chat us up at www.powersportsmarketing.com. Happy selling!